The first thing that needs to be done is have the SQL Database Administrator create a database instance for Asure 2009 to use. The security setting for the database needs to be set by the SQL Database Administrator. They need to grant full read/write privileges to the database instance. 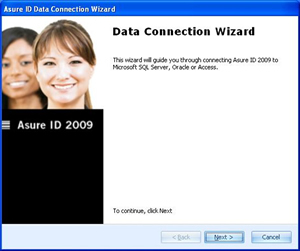 This will start the wizard to connect Asure 2009 to the SQL Database. 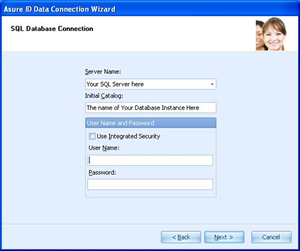 Click next to continue setting up the customer database configuration for Asure 2009. 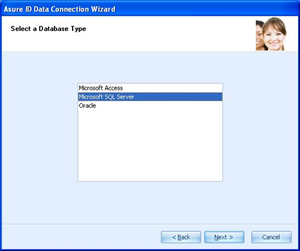 In this example choose “Microsoft SQL Server” and click “Next”. Under “Server Name” the name of the SQL Server needs to be entered. Then under “Initial Catalog” type in the name of the Database Instance that the SQL Database Administrator set up for Asure 2009 to use. The “User Name and Password” should be provided to you by your SQL Database Admin. These can either be specified user names and passwords or it can be set up to “Use Integrated Security”. This means that who ever logged on to the computer has access to the database. Once it is all filled out, click “Next”. The wizard is now complete. You can click the “Test” button to test the connection to the SQL Database. Once you have verified the connection click “OK”. Click “Finish” to exit the wizard. Safe-Card ID provides ID card printers and ID card software including Asure ID Software. Contact our ID card experts at 888-485-4696 for purchasing information. This entry was posted in Asure ID Software and tagged Asure ID 2009, Asure Software, ausre installation, set up asure, set up asure id 2009 on November 15, 2009 by SafeCard ID Team. Contact our ID-card experts toll-free at +1 888.485.4696 (US & Canada), or browse our web-store for special upgrade pricing to Asure ID 7. This entry was posted in Asure ID Software and tagged Asure ID, Asure Software, id card software on March 23, 2009 by SafeCard ID Team. Asure ID 2009 is no longer offered, and has been replaced by Asure ID 7. Want to test this latest iteration of Asure ID Card Software? The link below will take you directly to the product download page, where you’ll have access to a 30-day trial of this industry leading product, absolutely free! Asure ID Exchange Edition – Support for more sophisticated secure credential applications, providing advanced smart card functionality and laser engraving. Regardless of the edition selected, you will find Asure ID is easy to learn and full of features. It provides a wide range of capabilities in card issuance and card management for small and large organizations alike. For purchasing information, please check out our Asure ID information page, or go directly to the Safe-Card ID web-store. Or, to get your specific questions about ID-card software or ID-card printer systems addressed, contact our staff of ID experts toll-free at +1 888.485.4696 (US & Canada), or +1 704.535.5200 elsewhere. This entry was posted in Asure ID Software and tagged Asure ID, Asure ID Trial, id card software, Trial Software on March 19, 2009 by SafeCard ID Team. Asure ID Software – Which version is right for your application? The various versions of id card software by Asure sometimes is a complex process to wade through. It is important to consider what requirements the current organization needs in their id card uses as well as what might be required out of the id card in a couple of years. This software will last for some time and will need to encompass the abilities of id card printing for the foreseeable future. One way to make sure that you make the best decision in selecting the Asure ID software version is to review the features of each product to see if your current and possibily future requirements may be defined and the correct software version selected. The inital review may be best found by looking at the product selection guide that Asure ID makers have put together indicating the capabilities of each software version. Once that is reviewed, usually the decision can be narrowed into about what is needed. At that point, a specialist from an id card company can confirm the decision and provide the best possible options for smooth id card making. For additional information about Asure ID Card Software, id card printer systems or badge attachments, contact us for a free consultation at 888-485-4696. This entry was posted in Asure ID Software and tagged Asure ID, asure id software, id badge software on September 19, 2008 by SafeCard ID Team. Asure ID software is powerful id card design and printing software made by HID. 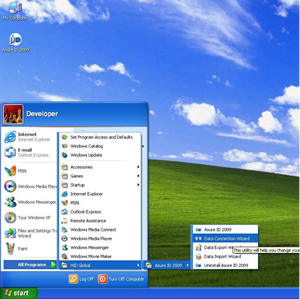 The software is trusted by organizations of all sizes and is rich in features and easy to learn. The software is able to provide card design, data management, card production and developer tool benefits to provide the capability to produce professional id cards for groups, organizations and business. The Asure ID Express is the stand alone photo id software. Containing many powerful features, this software exceeds the requirements of most small to medium businesses or high school applications. Following are the features of the Asure ID Express Software available in the versions of 5.x. For specific information about Asure ID Express, other Asure ID software versions or additional id card software options, contact our id card experts at 888-485-4696. This entry was posted in Asure ID Software and tagged Asure ID Express, Asure Software, id badge software on September 18, 2008 by SafeCard ID Team. 1. In the software card design center, click on the red or blue bar. 3. In the lower right corner, click on the field color. It says select color. 4. Click on define custom colors. 5. Adjust the color palette and run a test print. The above adjustments will adjust the color on the computer monitor as well and the monitor view may not look correct. Focus on the card output and adjust as needed to get the desired output. 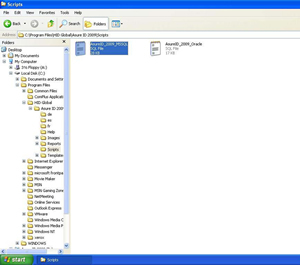 This entry was posted in Asure ID Software on September 15, 2008 by SafeCard ID Team.